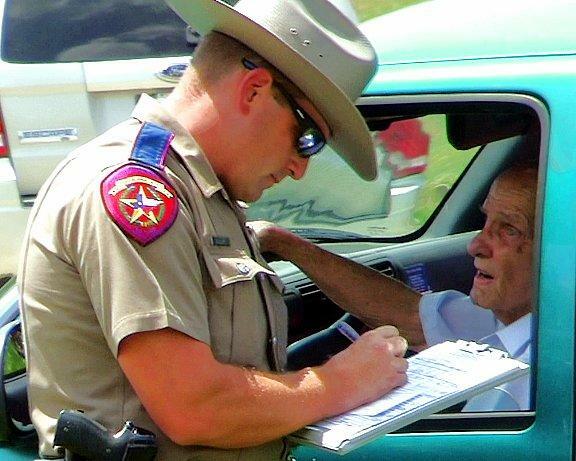 Trooper Ramey Bass speaks with 87 year old Billy Cooling of Livingston. According to witnesses, Cooling pulled into the south-bound lanes of US-59 and stopped in front of oncoming traffic. Fatal Accident at Loop 393, GOODRICH, August 21, 2011 - At approximately 12:25 pm on August 21, 2011, a fatal accident occurred on US-59 at Loop 393. The accident occurred when a green 2006 Chevy S-10 driven by Billy Cooling, 87, of Livingston, pulled into the south-bound lanes of US-59 from 393. According to witnesses, Cooling stopped in the middle of 59 and was nearly slammed by a dark gray 2003 Ford F-150 driven by Louis Moore, 64, of Houston. Moore swerved left to avoid striking Cooling. Moore's vehicle left the road so he swerved right back onto 59 and went too far, then over corrected back to the left, left the road into the median and rolled. Moore's vehicle came to rest upside down on the north-bound side of 59. Cooling pulled over to the side of the road by the median. Americare Ambulance Service was dispatched to the scene along with the Goodrich Volunteer Fire Department and the Livingston Volunteer Fire Department Heavy Rescue Unit. Additionally, Troopers Ramey Bass, Darwon Evans, and Kevin Burman were dispatched. Emergency personnel removed Moore's wife from the truck while Louis Moore was trapped inside. Firemen used the Jaws-of-Life to open the door and get inside to cut Moore's seatbelt and remove him from the back of the busted out windshield. Moore and his wife was transported to Livingston Memorial Hospital. Louis Moore died shortly after arrival. Traffic was partially blocked during investigation and cleanup. According to Trooper Ramey Bass, Billy Cooling is facing charges of failure to yield right of way from a stop sign, and could also be charged with negligent homicide. A rollback wrecker from Fawbush Wrecker Service recovered Moore's vehicle and it will be stored in Goodrich. The scene was cleared and traffic fully flowing by 1:40 pm. WARNING: The video report below and the pictures below show scenes from a violent accident. If this offends you in any way, DO NOT scroll down this page. Emergency Personnel work feverishly to get to driver Louis Moore of Houston (Trapped in vehicle). Louis Moore's wife, Betty, was transported by ambulance to Livingston Memorial with non-life-threatening injuries. ...the firemen moved to the other side of the truck and were able to open the passenger's side door with the Jaws-of-Life. Goodrich Fire Chief Ken Hambrick showed no regard for his own safety as he crawled into the precarious truck through the back windshield to help free Louis Moore. Billy Cooling (right) admitted to pulling in front of oncoming traffic. Louis Moore's vehicle was recovered by Fawbush Wrecker Service.